Vintage clothing can be any item of clothing that is more than 20 years old. That’s a lifetime to some people! Everything appears to come around in cycles, and what was in fashion so long again is likely to be in fashion again at some point. However, owning the actual vintage clothing and not a modern replica is important to some people. Let’s see how you can find the best deals in vintage clothing. Research or homework is always the key, but it is never more important than when shopping for genuine vintage articles. You should know the designers to look out for, as well as styles of the generation or era you are looking for. Modern replicas can look very authentic, so if you do online research, particularly with an organization such as The Vintage Fashion Guild, you won’t be led astray. 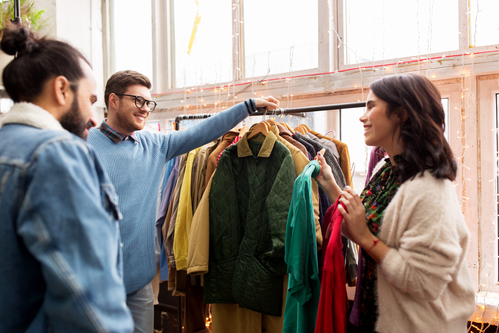 You can pick up some great bargains at antique fairs and shows, but you can also expect to pay top dollar as well, as the experts in the field know how sought-after these vintage clothing items are. However, if you are not ready to part with your hard earned cash at an antique fair, they are the perfect place to make contacts, add more research to your arsenal and make some great friends in the process. In fact, they may also be able to help you source something if you are looking for something particularly. Don’t forget these experts will also have their own sources. It may not be something you consider first on the list, but sizes over the years have changed dramatically. You may consider yourself to be one size, but a vintage item of clothing may be too big or too small for you. So be sure to take a tape measure along with you, unless you are willing and able to try the item on. It Might Look Great On The Hanger But …. You may find something that looks absolutely fabulous on the clothes hanger, but when you try it on it really doesn’t suit you. This isn’t uncommon, as it is the same with modern clothing. The accentuation may be different, or it may place an accent on a part of your body that you don’t like to be a focus of attention. Alternatively, you may see something that you would not ordinarily give a second glance but trying it on can produce an effect you are secretly pleased with. Be open-minded about your searches and If at all possible, you should always try something on before you buy it. Is It In A Good, Clean Condition? Vintage clothing may have been stored well by the original owners, or it may just have been left to gather dust. Before making a purchase, you should inspect the clothing thoroughly to ensure it is in good enough condition to last you for a while. One of the common problems is the seams, as cotton stitching can deteriorate overtime. Fading can be another issue, so check over the whole of the garment for areas of discoloration. You will obviously check for staining or odors caused by smoke or perspiration, etc. NY Showplace loves dealing in vintage clothing, and not only do we offer a good deal to sellers of vintage clothing, but we have many satisfied customers who have bought from our auctions too!